Chris Daskalakis, Nika franchise and Mr. Fire Safety takedown demand received by UnhappyFranchisee.Com and our response. (UnhappyFranchisee.Com) UnhappyFranchisee.Com allows anonymous complaints and sometimes posts unflattering information about specific franchise concepts. Every person or company discussed is offered the chance to provide responses, corrections or rebuttals. Unfortunately, some respond with takedown demands, bullying and legal threats. We always take their requests seriously, and try to respond as warranted by the tone of their request. Polite, respectful requests generally warrant polite and respectful responses. Overly threatening, arrogant and misguided attempts at intimidation generally receive derisive, mocking responses. We took the takedown request from Nika franchise and Mr. Fire Safety franchisor Chris Daskalakis seriously . However, after researching more fully, we found his representations unreliable and decided to stand by our original statements. My name is Chris Daskalakis and I am the owner and franchisor of the Nika company and the Mr. Fire Safety. I saw my name and names of our companies on your website and I am requesting that you DELETE the entire post IMMEDIATELY. You are claiming that my former Mr. Oil Saver Company and the Zougla List company are franchises, and they are NOT. WE HAVE NEVER SOLD FRANCHISES OF THOSE COMPANIES, NOR WERE THEY FRANCHISES. However, my Nika Business company and my Mr. Fire Safety is a franchise with a legal FDD, but we have NEVER had a single complained from ANY of our franchisees from those 2 companies. Nor any law suits from those franchise companies. 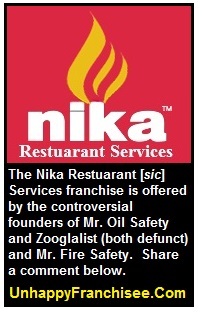 Your article is threatening the reputation of our existing franchises (Nika and Mr. Fire Safety) by lumping all the non franchise companies we have started and law suits for those companies and implying that we are bad franchisors, when in reality we have NEVER had a single complaint from any of our Nika or Mr. Fire safety franchises. WE AM REQUESTING THAT YOU DELETE OUR POST, CHRIS DAKALAKIS NAME AND OUR NON-FRANCHISE COMPANY NAMES SO WE DO NOT APPEAR ON ANY INTERNET SEARCH ENGINES. IF THIS IS NOT DONE WITHIN THE NEXT 7 DAYS, WE WILL BE TAKING AGGRESSIVE LEGAL ACTION AGAINST YOUR COMPANY. GOVERN YOURSELF ACCORDINGLY. As we said in our previous messages, we value the input and the rights of those discussed on our sites, and take requests for removal very seriously. We have looked into the statements and representations that you claim were inaccurate and, based on what we’ve found, are unconvinced that our representations are incorrect. Of course, you are invited to provide further substantiation and corrections for us to review. #1 You claimed Zooglalist was not and had never been a franchise. #2 You claimed Mr. Oil Saver was not and had never been a franchise. You stated “WE HAVE NEVER SOLD FRANCHISES OF THOSE COMPANIES, NOR WERE THEY FRANCHISES.” However, several state examiners ruled that Mr. Oil Safety met the legal definition of a franchise. As your signature on the many enforcement actions indicate, a “distributor” or “license” opportunity is still a franchise if it meets the 3-prong definition of a franchise no matter what it’s called. While you may not believe that Mr. Oil Saver was a franchise, several state franchise agencies have formally stated that it met the definition of a franchise in their states and that you should have followed the applicable franchise registration and disclosure laws. The enforcement actions from Virginia, California, Minnesota, and Washington contain references to complaints that relate to Mr. Fire Safety as well as Mr. Oil Saver. Even if it were strictly true that you had NO franchisee complaints regarding your two current offerings, it would seem disingenuous to indicate you had “no complaints” when you’ve had at least 5 state enforcement actions. We do not state that you are bad franchisors and do not tell anyone whether they should invest in your franchise or not. We make no statements regarding the quality of the services your franchisees perform. Of course, voicing those opinions are within our rights, bute don’t see that as our jobs. Our goal is to raise the issues prospective franchisees should look into, and help provide the information so that our readers can make their own informed decisions. We don’t endorse or condemn individual franchises. The Federal Trade Commission (FTC) requires franchisors to disclose certain, relevant information to prospective franchisees, whose decisions will affect the financial futures of their families. We believe the FTC, for instance, requires that you disclose the enforcement actions that we just posted and the status of the penalties imposed on you, that you disclose the terms of the voluntary agreement with the Florida AG, that you disclose your lawsuit with the Mr. Oil Saver distributor, and that you disclose your current bankruptcy proceedings. Franchisors often believe that we are picking on them. This is not the case. Ask yourself, Mr. Daskalakis, wouldn’t you want to know those things if your were in your prospective franchisees’ situations? We believe franchisors with controversial pasts are better served by focusing on avoiding – and fixing – their past mistakes than trying to hide them. If you would like to share with us the lessons you’ve learned from your past mistakes and steps you’ve taken to not repeat them, we will be happy to publish them. ARE YOU FAMILIAR WITH CHRIS DASKALAKIS, PAULINE DASKALAKIS & THE NIKA FRANCHISE OR MR. FIRE SAFETY? SHARE A COMMENT BELOW. 1-800-Vending / Healthy You Vending Machines: Overpriced & Inferior?